A few months ago, I met an energetic young man, who showed me “the next big thing” in idea management software. Jesper Juel Jensen presented me for a beta version of Ideanote. Great enthusiasm, and of course a few glitches here and there. “Oh no, ” I thought, “yet another software solution, that claims to save the world”. 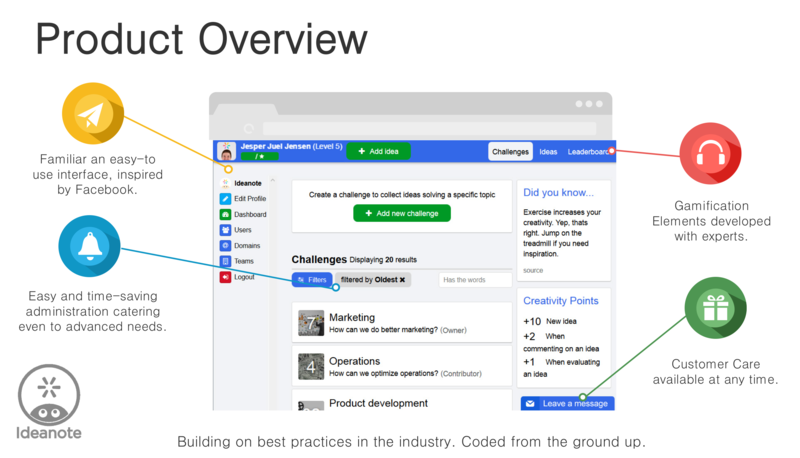 Recently, I wrote a post about the plethora of idea management systems. I argue why they are only the top of the innovation management iceberg. You need to have much more than a software package to make innovation stick. A summer passed, and today I met up with Jesper Juel Jensen again, at Dare2Mansion in Copenhagen. 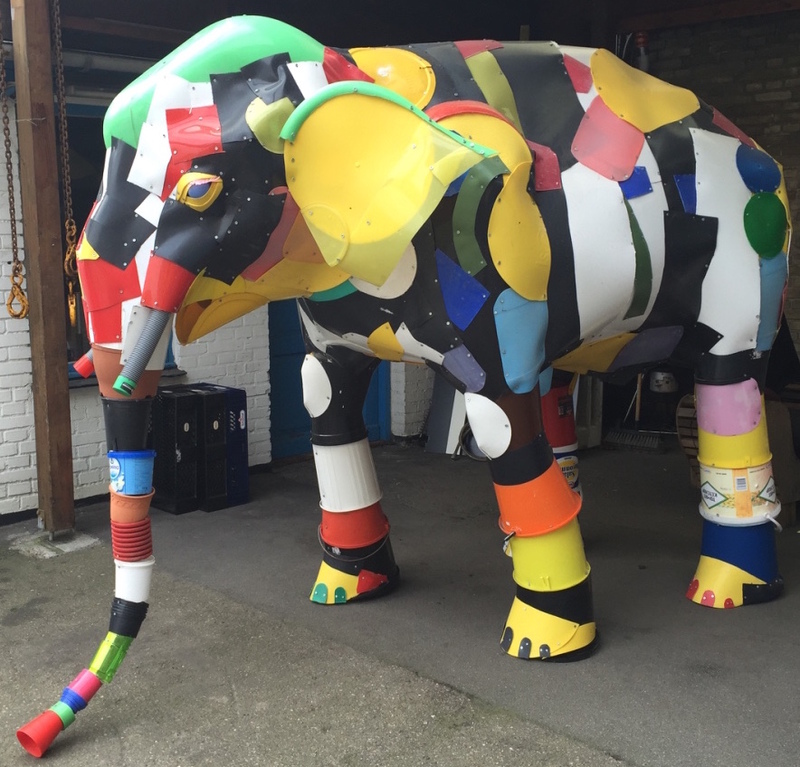 By the entrance, there is a life-size elephant statue, which I think is a great metaphor for the Ideanote project. I think they are on to something big. Ideanote has come a long way, thanks to diligent and dedicated work by Jesper and his team. Gamification. High user engagement through a motivating platform built with experts in the field. Artificial intelligence based buckets, saving time through automatic content analysis and clustering. Works on all platforms: Mobile-Friendly, Android & iOS Apps – ideas can even be submitted per SMS. The gamification part got me engaged right away – so it works! Our new innovation board game InnoCulture is a good example on how we have used gamification to enable learning and dialogue about systematic innovation. 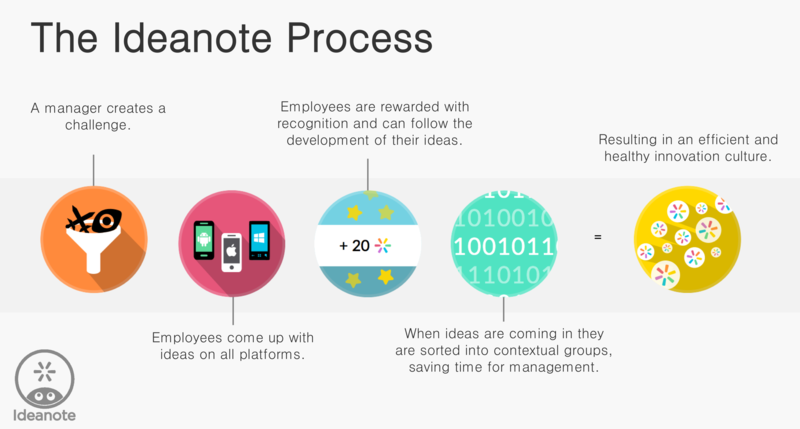 You can signup to Ideanote for free, with up to 10 users, 200 ideas, 2 challenges, and 1 team. There are two other priced options, Basic and Premium. combine ideas into strong concepts. Ideanote handles 1-4 well, 5-6 are in the works, as far as I understand. No. 7 are a little further down the road. So what is it that make these 7 elements important? Much too often, we expect participants to hit the ground running, when we embark on a new project. Kick-off’s are usually energetic and positive, and expectations are high. But to it requires more than a great kickoff to stay engaged after the event – when the project work starts. One of the keys to ensure this engagement is to involve the participants well ahead. By doing this, the project will get some initial ideas and thoughts. And people will get an opportunity to consider whether they want to engage in the project at all. Why are computer games so addictive? Well, one of the reasons is that we have a constant monitoring of progress. In Ideanote, you have a scoreboard, and can see how many points you have gained. Simple, and it works :-) Also, you can follow how your colleagues have contributed. And you can get various overviews of your progress. Teresa Amabile has written a great book about tracking progress, called “The Progress Principle“. One of her conclusions is that in order for workers to stay intrinsically motivated, they need to have a genuine sense of progress. Rating and commenting on ideas is an essential feature of most idea management systems. Also, your overview tends to deterioate when the number of ideas increase. I have yet to see a good solution to this dilemma. Ideanote has a novel system of “buckets”, where you can put your ideas. This is partly based on Artificial Intelligence, but you can also create manual “buckets”. Again, the overview becomes difficult with a large number of ideas. But it does make sense to use this, once an initial idea rating has been made. People also create ideas when they work together face-2-face. And they create ideas when they are alone. In fact, many people come up with the best ideas when alone. A lot of the criticism of traditional brainstorming rests on this observation. I have yet to see an innovation management system that handles this in a seamless way. Once we have developed initial concepts, they must integrate with the client’s projects. We must describe the concept in terms that are in sync with the way the organisation handles projects. Applying the organisation’s own evaluation criteria and description terms will make the transfer easier. Most ideas are bad, regardless of how many “likes” or comments it has received. For this reason, a raw filtration ow raw ideas is fruitless. In my experience, great ideas arise from combination, not filtration. This would be a great feature to add to Ideanote! Granted, this is not an easy task, and I don’t have the solution to this. Advanced semantic text analysis may be part of the solution. When we work with innovation projects, we take all of the above parameters into careful consideration. I am totally confident that products like Ideanote will enable us to do these things faster and better.